It is possible that sleep disorders could be relieved when the underlying eye diseases are treated. Cataract is a typical disease allowing a distinct intervention, and improvement in sleep after cataract surgery has been documented by many investigators.12,13 However, although DED is a very common eye disease worldwide, usually treated with eyedrops,14–16 punctal occlusion, and other medicine, it was demonstrated only recently that DED leads to a deteriorated quality of life17 and depression.6,7 Therefore, other relevant medical care may also be needed in patients with DED. In the present study, we evaluated sleep quality before and after medical intervention for DED to determine whether ophthalmic intervention affected the psychiatric condition. Next, we opened a monthly sleep clinic for poor sleepers from the general eye clinic to provide a sleep service and an ophthalmic service in the same location. Eight eye clinics in various practices and locations participated in this study and Institutional Review Board of Shinseikai Toyama Hospital approval was obtained for the study. All patients visiting the sleep service provided written informed consent before taking part in the study. Patients from the eight participating eye clinics were diagnosed with DED according to the guidelines of the Japanese Dry Eye Society,20,21 which classifies DED into definite DED (DDED), probable DED, and non-DED according to the presence of dry eye symptoms, disturbance of tear film, and keratoconjunctival epithelial damage. Consecutive cases diagnosed with DDED and probable DED were enrolled in the study. To exclude vision and photoentrainment disorders possibly related to sleep and mood, patients were excluded if they also had severe glaucoma (mean deviation <-12 dB in either eye), bilateral cataracts, or bilateral visual impairment (<20/30 in both eyes). The prescribed eyedrops for the treatment of DED were hyaluronate, mucin secretagogue, and steroid, that is, 0.1%/0.3% Hyalein (sodium hyaluronate; Santen Pharmaceutical Co. Ltd., Osaka, Japan), Diquas (3% diquafosol sodium; Santen Pharmaceutical Co. Ltd.), Mucosta (2% rebamipide; Otsuka Pharmaceutical, Co. Ltd., Tokyo, Japan), and 0.02%/0.1% Flumetholon (fluorometholon; Santen Pharmaceutical Co. Ltd.). 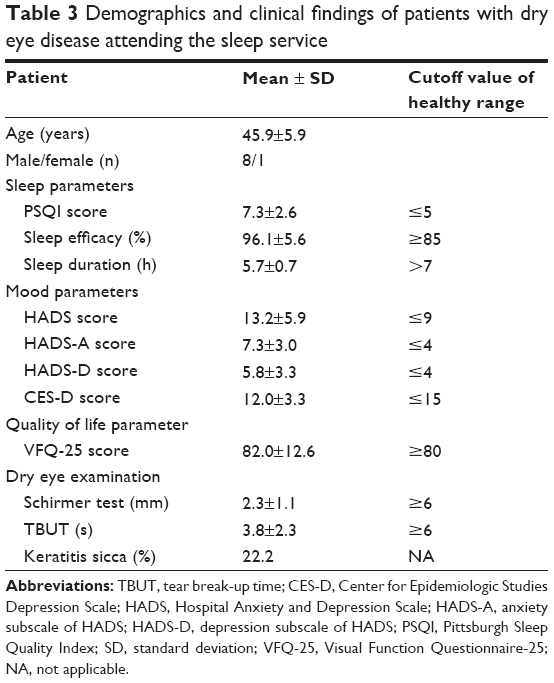 For the initial evaluation, conducted from January to December 2014, patients enrolled in the study were provided with questionnaire containing the Pittsburgh Sleep Quality Index (PSQI)22 and the Hospital Anxiety and Depression Scale (HADS).23 Photophobia and chronotype (morningness/eveningness) were evaluated with two representative questions from established questionnaires (National Eye Institute Visual Function Questionnaire-25 [VFQ-25] and Morningness/Eveningness questionnaire).24,25 The photophobia score ranged from 100 (best) to 0 (worst) and the morningness/eveningness score ranged from 10 (far morningness) to 0 (far eveningness). We measured the severity of photophobia since it is one of the major symptoms of DED16 and it may be associated with sleep and mood status. A final evaluation was conducted from November 2014 to February 2015 using the same questionnaire by interview or by mail 3–10 months after the initial evaluation. Both the initial and final evaluations were conducted in the winter season to avoid any bias due to a seasonal effect. Patients were classified as improved if the PSQI or HADS score decreased by two or more points. We opened a monthly sleep service in two of the general eye clinics in September 2014. Each session was an hour for new patients and 15 minutes for revisiting patients. The sleep service included a comprehensive eye examination composed of standardized visual field testing, optical coherence tomography, and DED shielding with a Schirmer test, tear break-up time, and vital (fluorescein or lissamine green) staining. These tests were determined according to the results of a large survey11 demonstrating that patients with DED, cataract, and glaucoma were potentially poor sleepers. Other procedures performed during the sleep service included taking a comprehensive medical history, sleep diary, wrist actigram for recording sleep/wake cycle, and the Japanese versions of the PSQI, HADS, and VFQ-25 questionnaires. After initial evaluation of ocular and sleep problems, guidance was given by a team of specialists including a board certified ophthalmologist, board certified geriatrician, psychologist, chronobiologist, and sleep therapist, in the same clinic on an appointment basis. Ophthalmologist-driven care for sleep problems included comprehensive eye care, eyedrop prescriptions, advice on bedroom/living room lighting and shading, blue light shield eyewear, and herbal and other supplements. A follow-up survey was posted to each sleep service participant 3–6 months after the initial visit. Where appropriate, data were given as the mean ± standard deviation. The mean score and proportion of patients with improvement (Δ) in PSQI scores were compared between the subgroups (newly diagnosed DED and established DED). To identify which prominent factors were correlated with the initial value and improvements in psychiatric indices (sleep and mood disorders) in patients with newly diagnosed DED, a regression analysis was carried out with PSQI and HADS scores as dependent variables and clinical parameters as independent variables. All analyses were performed using StatFlex (Atech, Osaka, Japan) and SPSS version 21 (IBM Corporation, Armonk, NY, USA), with P<0.05 considered significant. A total of 1,000 eye clinic visitors with various eye diseases were initially examined and of these, 222 were diagnosed with DED. Following inclusion and exclusion criteria, 71 patients were finally enrolled in this study and analyzed, of whom 25 patients were newly diagnosed with DED and 46 had established DED. Patient demographics and clinical findings are shown in Table 1. The mean PSQI and HADS at the initial evaluation were 6.9±3.8 and 9.6±6.6 for new patients and 5.8±3.2 and 9.7±5.5 for established patients, respectively (not significant, Mann–Whitney U-test). The proportion of patients with DDED and probable sleep disorders (PSQI ≥6), and probable mood disorders (HADS ≥10) was greater for those newly diagnosed with DED than for those with established DED. The morningness/eveningness score and photophobia score were 4.4±2.6 and 81.5±15.9 for new patients and 4.7±2.2 and 85.9±19.1 for established patients, respectively. More patients newly diagnosed with DED had an indication for steroid eyedrops than those with established DED, whereas the majority of established patients were treated with hyaluronate only. The mean PSQI and HADS scores at the final evaluation were 6.5±4.4 and 9.8±8.0 for new patients and 6.6±3.4 and 10.5±4.7 for established patients, respectively (not significant, Mann–Whitney U-test). A significantly greater proportion of patients with newly diagnosed DED had improved PSQI scores than those with established DED (P<0.05, chi-square test; Figure 1). The morningness/eveningness and photophobia scores at the final evaluation were 4.4±2.3 and 86.5±17.6 for new patients and 4.1±2.0 and 86.8±18.7 for established patients, respectively (Figure 1). 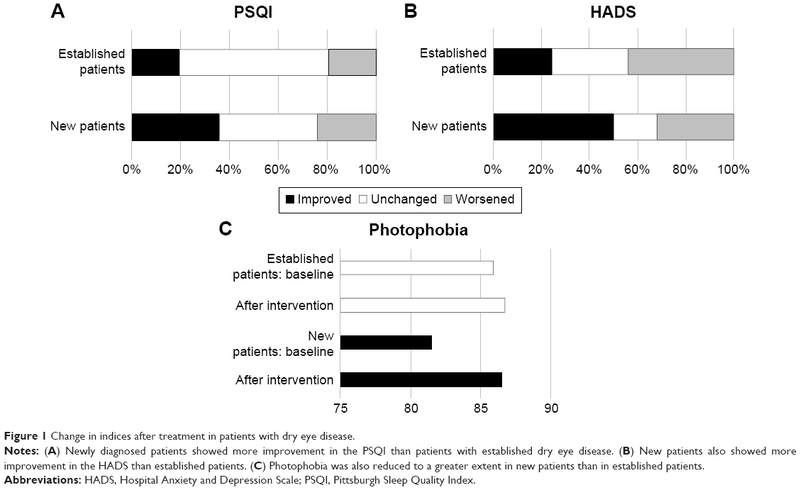 Photophobia improved significantly in the newly diagnosed patients (P<0.05, paired t-test). Notes: aUnpaired t-test for age and chi-square tests for the other values. bAs defined by the Japanese Dry Eye Society. *Significant difference between groups, P<0.05. Abbreviations: HADS, Hospital Anxiety and Depression Scale; NS, not significant; PSQI, Pittsburgh Sleep Quality Index; SD, standard deviation; w/wo, with/without. Figure 1 Change in indices after treatment in patients with dry eye disease. Notes: (A) Newly diagnosed patients showed more improvement in the PSQI than patients with established dry eye disease. (B) New patients also showed more improvement in the HADS than established patients. (C) Photophobia was also reduced to a greater extent in new patients than in established patients. Abbreviations: HADS, Hospital Anxiety and Depression Scale; PSQI, Pittsburgh Sleep Quality Index. Regression analysis demonstrated the Δ PSQI score was significantly correlated with the Δ HADS score (P<0.05, Pearson product moment correlation), but not with age, severity of DED, or the initial PSQI score (Table 2, Figure 2). The initial HADS score was correlated with the initial PSQI score (P<0.05), but not with the severity of DED. The Δ HADS score was correlated with the Δ PSQI score only. Notes: aMale =1, female =0. bDefinite dry eye disease =1, probable dry eye disease =0. *P<0.05, Pearson product moment correlation. Δ = (final score) – (initial score). 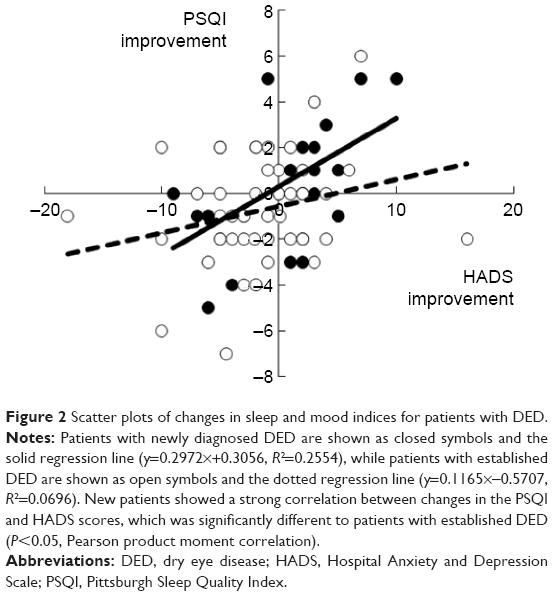 Figure 2 Scatter plots of changes in sleep and mood indices for patients with DED. Notes: Patients with newly diagnosed DED are shown as closed symbols and the solid regression line (y=0.2972×+0.3056, R2=0.2554), while patients with established DED are shown as open symbols and the dotted regression line (y=0.1165×-0.5707, R2=0.0696). New patients showed a strong correlation between changes in the PSQI and HADS scores, which was significantly different to patients with established DED (P<0.05, Pearson product moment correlation). Abbreviations: DED, dry eye disease; HADS, Hospital Anxiety and Depression Scale; PSQI, Pittsburgh Sleep Quality Index. Ten patients, nine with DED, visited the sleep service during the first five sessions at our clinics and all were initially cared for by an ophthalmologist after medical interview and comprehensive ocular examinations. Their demographics, sleep problems, ocular status, and the consequences of providing the sleep service are shown in Tables 3 and 4. The visual field and retinal nerve fiber layer thickness measured by optical coherence tomography were normal in all patients. Two patients had established DED and seven had newly diagnosed DED. The mean PSQI, HADS, and VFQ-25 scores were 7.0±3.5, 12.5±4.4, and 85.6±11.0, respectively. Hyaluronate eyedrops were prescribed for DED in four patients, diquafosol in three patients, and rebamipide in one patient. Blue light shield eyewear in the evening was recommended for three patients and a wearable blue light therapeutic lamp (Re-Timer; Japan Weatherly Inc., Tokyo, Japan) was recommended in the morning for two patients. A melatonin receptor agonist, ramelteon (Roserem; Takeda Pharmaceutical Company Ltd., Osaka, Japan) was prescribed for two patients and a sedative herb (Yokukansan Extract Granule; Tsumura & Co., Tokyo, Japan) for one patient. No patient required or requested formal psychiatric consultation or referral due to serious neuropsychiatric conditions. Eight of the nine patients with DED answered the follow-up survey 3–6 months after the initial evaluation. The mean evaluation score for the sleep service was 8.8±0.7 (10= best, 1= worst) and the mean score for sleep improvement was 7.3±1.3 (10= best, 1= worst). The mean PSQI, HADS, and VFQ-25 scores were 5.9±4.4, 11.6±4.4, and 88.5±6.7, respectively, and each index was not significantly different compared with the initial evaluation. Abbreviations: TBUT, tear break-up time; CES-D, Center for Epidemiologic Studies Depression Scale; HADS, Hospital Anxiety and Depression Scale; HADS-A, anxiety subscale of HADS; HADS-D, depression subscale of HADS; PSQI, Pittsburgh Sleep Quality Index; SD, standard deviation; VFQ-25, Visual Function Questionnaire-25; NA, not applicable. Notes: aEvaluation score, 10= best, 1= worst. bNewly diagnosed patient. Abbreviations: TBUT, tear break-up time; DED, dry eye disease; F, female; LASIK, laser-assisted in situ keratomileusis; M, male; NR, non-response. Treatment of DED was more effective in improving sleep and mood problems in patients with newly diagnosed DED than in those with established DED. An improvement in mood was prominent in new patients and it was significantly correlated with an improvement in sleep. These patients had depression and sleep disorders, both of which might be associated with DED. Our results suggest the patients were happy that a diagnosis was made and that the eye clinic also addressed their distress. We made a hypothesis that explains the relationships between DED and sleep in Figure 3. Patients may be distressed by ocular discomfort, eye fatigue by blurring and photophobia, or by psychological distress from the disease itself. They may have ocular irritation during sleep due to entrapped inflammatory molecules and microorganisms on ocular surface26 and some patients may have nocturnal lagophthalmos.27 These causalities may contribute to depression, sleep difficulty, and sleep disorder. 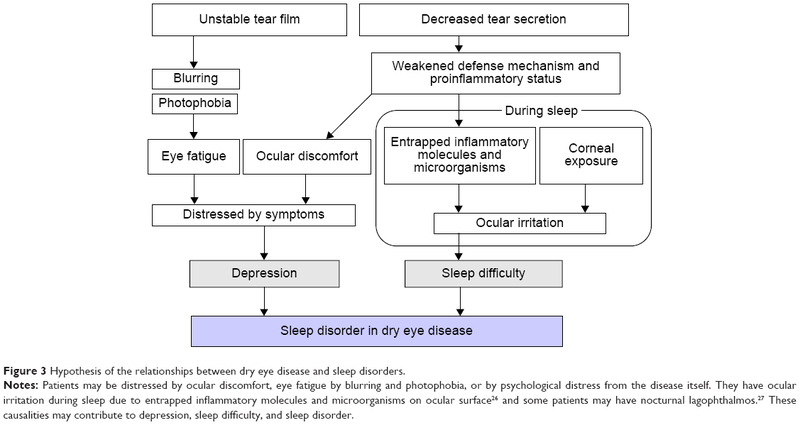 Figure 3 Hypothesis of the relationships between dry eye disease and sleep disorders. Notes: Patients may be distressed by ocular discomfort, eye fatigue by blurring and photophobia, or by psychological distress from the disease itself. They have ocular irritation during sleep due to entrapped inflammatory molecules and microorganisms on ocular surface26 and some patients may have nocturnal lagophthalmos.27 These causalities may contribute to depression, sleep difficulty, and sleep disorder. It is notable that improvements in sleep and mood were not correlated with the initial value or severity of DED. The mood of patients with DED may not fully depend on their ocular condition and personal issues may contribute to sleep and mood disorders in newly diagnosed patients.28 Photophobia is a common symptom in DED16 that could occur due to ocular pain and sensitivity to light. Photophobia in new patients significantly improved after treatment for DED, suggesting a potent treatment effect of eyedrops on sleep quality, although whether such an effect is placebo, psychological, or pharmacological remains undetermined. One unanswered question is how long the effect on sleep and mood is sustained in patients with DED, since the sleep and mood status of patients with established DED did not change during the study period. The new initiative of a sleep service was successfully established for patients with DED and sleep problems. Patient evaluation of the sleep service was mostly satisfactory, as indicated by the follow-up survey. Patients at the sleep service also had an opportunity to review their lifestyle and were also given personalized recommendations from specialists in a variety of fields for the first time, which would have been otherwise inaccessible. A few tips for lighting, bedtime, drinking, and shield eyeglasses seemed helpful in supporting their sleep quality. Patients in a general clinic may hesitate to visit a psychiatric clinic as they may not recognize sleep disorders as a psychiatric disease. Thus, considerable time might be needed to check the sleep and ocular conditions that affect daily work and life in such patients, including DED, presbyopia, eye fatigue, and refractive errors. The consultation-liaison psychiatry service is a collaboration with psychiatrists and other medical specialists. Conventionally, ophthalmology and psychiatry do not have a close interface; however, the preliminary results of our sleep service suggest the new possibility that liaison psychiatry could be beneficial for some patients with ocular disease, especially DED. Sleep guidance is usually performed by psychiatrists, psychologists, nurses, dietitians, and other specialists. Referral from a qualified ophthalmologist would be helpful in addressing patient overlap since ophthalmologists can simply follow the guidelines issued by the academic society and the Ministry of Health. They can correlate ocular findings with the patient’s sleep problems and then refer the eye patient to a psychiatrist. Blue light shield eyewear, wearable light therapy lamps, herbal supplements, melatonin agonists, and validated questionnaires are safe, easy, and useful tools for nonpsychiatrists to use in the basic care of poor sleepers. Consultation-liaison psychiatry services have been effectively applied in cases of cancer, pediatric disorders, and chronic disabling diseases, and thus could become a new clinical service and valuable opportunity for eye clinic patients with psychiatric problems. This study has some limitations. Causality of probable psychiatric problems and treatment effects should be determined using detailed ocular findings and various interventions in a large case series. Sleep quality should be evaluated with objective methods including electroencephalogram, actographs, measurement of melatonin, and other indicators. Psychiatric status should also be confirmed by formal psychiatric examination in addition to questionnaires. There is no control group without any treatment for DED, since it is not ethical to observe DED patients without prescribing eyedrops. We previously reported high prevalence of probable sleep and mood disorders in DED patients compared with patients with other ocular diseases11 and believe established patients were relevant controls for newly diagnosed patients. Our study found that ophthalmic intervention was more effective in improving sleep quality in patients with newly diagnosed DED than in patients with established DED. Preliminary results were successfully obtained from a sleep service within the eye clinic. Our results suggest a consultation-liaison psychiatry service may be helpful for patients with DED and potential psychiatric problems. The authors thank Dr Yoshihiro Hashimoto, Dr Mariko Ishikawa, and Dr Naohisa Nezu for help with data collection, and Dr Takayuki Abe for help with the statistical analysis. The authors acknowledge the assistance of Inter-Biotech (http://www.inter-biotech.com) with the English language editing of this manuscript. The content of this paper has not been published or submitted for publication elsewhere. The research project was approved by a suitably constituted Ethics Committee of the institution within which the work was undertaken, and it conforms to the provisions of the 1995 Declaration of Helsinki (as revised in Edinburgh, 2000). No financial support reported. Moseley MJ, Fouladi M, Jones HS, Tobin MJ. Sleep disturbance and blindness. Lancet. 1996;348:1514–1515. Brody BL, Gamst AC, Williams RA, et al. Depression, visual acuity, comorbidity, and disability associated with age-related macular degeneration. Ophthalmology. 2001;108:1893–1900. Mabuchi F, Yoshimura K, Kashiwagi K, et al. Risk factors for anxiety and depression in patients with glaucoma. Br J Ophthalmol. 2012;96(6):821–825. Kong XM, Zhu WQ, Hong JX, Sun XH. Is glaucoma comprehension associated with psychological disturbance and vision-related quality of life for patients with glaucoma? A cross-sectional study. BMJ Open. 2014;4(5):e004632. Ishii K, Kabata T, Oshika T. The impact of cataract surgery on cognitive impairment and depressive mental status in elderly patients. Am J Ophthalmol. 2008;146:404–409. Labbé A, Wang YX, Jie Y, Baudouin C, Jonas JB, Xu L. Dry eye disease, dry eye symptoms and depression: the Beijing Eye Study. Br J Ophthalmol. 2013;97:1399–1403. Wen W, Wu Y, Chen Y, et al. Dry eye disease in patients with depressive and anxiety disorders in Shanghai. Cornea. 2012;31:686–692. Kessel L, Siganos G, Jørgensen T, Larsen M. Sleep disturbances are related to decreased transmission of blue light to the retina caused by lens yellowing. Sleep. 2011;34(9):1215–1219. Agorastos A, Skevas C, Matthaei M, et al. Depression, anxiety, and disturbed sleep in glaucoma. J Neuropsychiatry Clin Neurosci. 2013;25(3):205–213. Gracitelli CP, Duque-Chica GL, Moura AL, et al. A positive association between intrinsically photosensitive retinal ganglion cells and retinal nerve fiber layer thinning in glaucoma. Invest Ophthalmol Vis Sci. 2014;55(12):7997–8005. Ayaki M, Kawashima M, Negishi K, Tsubota K. High prevalence of sleep and mood disorders in dry eye patients: survey of 1,000 eye clinic visitors. Neuropsychiatr Dis Treat. 2015;11:889–894. Ayaki M, Negishi K, Suzukamo Y, Tsubota K. Color of intra-ocular lens and cataract opacity type are prognostic determinants for health indices after photoreceptive restoration by surgery. Rejuvenation Res. 2015;18(2):145–152. Alexander I, Cuthbertson FM, Ratnarajan G, et al. Impact of cataract surgery on sleep in patients receiving either ultraviolet blocking or blue-shielding intraocular lens implants. Invest Ophthalmol Vis Sci. 2014;55:4999–5004. Shimmura S, Ono M, Shinozaki K, Toda I, et al. Sodium hyaluronate eyedrops in the treatment of dry eyes. Br J Ophthalmol. 1995;79(11):1007–1011. Tauber J, Davitt WF, Bokosky JE, et al. Double-masked, placebo-controlled safety and efficacy trial of diquafosol tetrasodium (INS365) ophthalmic solution for the treatment of dry eye. Cornea. 2004;23(8):784–792. Kinoshita S, Awamura S, Oshiden K, Nakamichi N, Suzuki H, Yokoi N; Rebamipide Ophthalmic Suspension Phase II Study Group. Rebamipide (OPC-12759) in the treatment of dry eye: a randomized, double-masked, multicenter, placebo-controlled phase II study. Ophthalmology. 2012;119(12):2471–2478. Uchino M, Schaumberg DA. Dry eye disease: impact on quality of life and vision. Curr Ophthalmol Rep. 2013;1:51–57. Smith GC. The future of consultation-liaison psychiatry. Aust N Z J Psychiatry. 2003;37(2):150–159. Ogawa A, Nouno J, Shirai Y, et al. Availability of psychiatric consultation-liaison services as an integral component of palliative care programs at Japanese cancer hospitals. Jpn J Clin Oncol. 2012;42(1):42–52. Uchino Y, Uchino M, Dogru M, Ward S, Yokoi N, Tsubota K. Changes in dry eye diagnostic status following implementation of revised Japanese dry eye diagnostic criteria. Jpn J Ophthalmol. 2012;56(1):8–13. Buysse DJ, Reynolds CF III, Monk TH, Berman SR, Kupfer DJ. The Pittsburgh Sleep Quality Index: a new instrument for psychiatric practice and research. Psychiatry Res. 1989;28:193–213. Suzukamo Y, Oshika T, Yuzawa M, et al. Psychometric properties of the 25-item National Eye Institute Visual Function Questionnaire (NEI VFQ-25), Japanese version. Health Qual Life Outcomes. 2005;3:65. Horne JA, Ostberg O. A self-assessment questionnaire to determine morningness-eveningness in human circadian rhythms. Int J Chronobiol. 1976;4:97–110. Sack RA, Beaton A, Sathe S, Morris C, Willcox M, Bogart B. Towards a closed eye model of the pre-ocular tear layer. Prog Retin Eye Res. 2000;19(6):649–668. Latkany RL, Lock B, Speaker M. Nocturnal lagophthalmos: an overview and classification. Ocul Surf. 2006;4(1):44–53. Nichols KK, Nichols JJ, Mitchell GL. The lack of association between signs and symptoms in patients with dry eye disease. Cornea. 2004;23(8):762–770.